Discover interesting facts and information about Native American Tools used by Indian tribes. Description and Definition of Native American Tools: Native American Tools were made of stone, primarily Flint, the process was called Flint Knapping and the weapon and tool makers were Flint Knappers. The tools were used to make weapons for fighting and hunting including Axes, Arrows, Spear, Knives, Tomahawks. Native American tools were also used to make every other useful implements for scraping and cleaning animal hides, drilling holes in hide, wood or leather and engraving stone, bone, or carving wood. Native America tools were used to make weapons for fighting and hunting, fishing, clothing, transport such as canoes and travois, shelter and decorations and for creating art such as rock pictures. Stone receptacles were also made to hold household items and war paint pigment. An Adze was a stone tool with a curved blade used like a chisel to work wood making items such as canoes. Awls were bone or stone tools tapered to a point and used to pierce holes. The following awl hand tool was also used for shredding plant fibers for sewing thread and fishing nets. Arrow Straightener The Arrow Straightener was an extremely useful tool made from an antler. 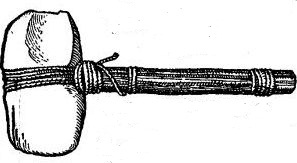 Burin A burin was a tool flaked into a chisel point for inscribing or grooving bone, stone, wood, leather or antler. A piece of flint from which flakes are removed from the core to make other stone tools and weapons such as knives, scrapers, spear pints, drills etc. Hammerstone A hammerstone was a hard, often oblong or rounded stone, used in flint knapping. Jawbone The jawbone of a buffalo or a horse was used by the Plains Native to create a weapon called the jawbone club. The hitting edge of the weapon would be sharpened and the teeth inside the jaw bone were left intact. Knives Tools which were flaked to form one or more cutting edges. Knives were essential tools used for cutting meat, hides, wood and food. Needles Small sewing needles made of bone with punched eyeholes. Used together with thread made from plant fibers or animal sinew. An End Scraper was a heavy duty tool that was used for scraping fur from animal hides and removing the fatty tissue from its underside. The Stone Age life style of Native Americans ranged from nomadic, semi-nomadic to static across the vast continent of North America and despite this many of them shared similar culture and Native American Tools. The basic component of the majority of their their tools were stone. Native American Tools. Discover the interesting facts and information which relate to the History of Native Americans and the tools and weapons they used. The pictures on this site show the tools and tools that were used by various Native Indian tribes that can be used as a really useful educational history resource for kids and children of all ages. 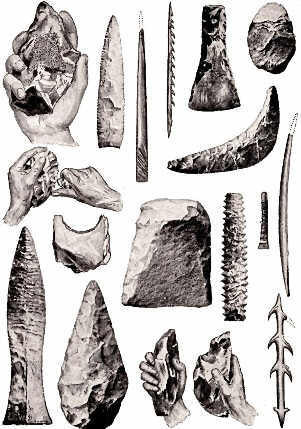 We have included pictures and videos to accompany the main topic of this section - Native American Tools. The videos enable fast access to the images, paintings and pictures together with information and many historical facts. All of the articles and pages can be accessed via the Native Indian Tribes Index - a great educational resource for kids providing an unusual insight into their culture. We hope you enjoy watching the videos - just click and play - a great resource for gaining facts and information about the life of Native American Indians.